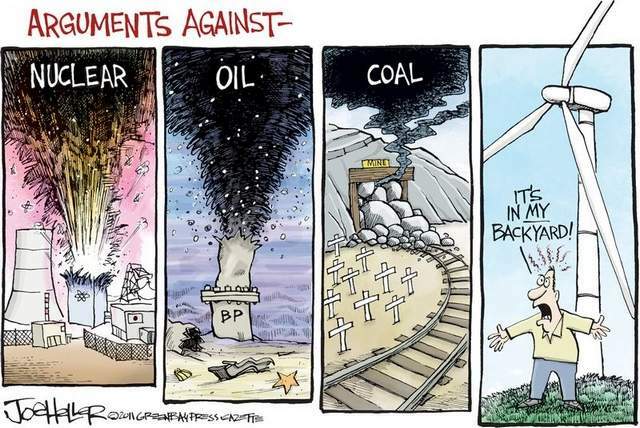 Courtesy of Climate Progress and Bill Becker, this cartoon on Nimbyism. Treehugger – What does the Green Party election win in Germany mean? Here are two sites also worth checking – the SustainAbility blog and The PERColator. BP is set to announce a deal with Russian state run energy giant Rosneft, according to the BBC. The share swap deal could allow BP to drill for oil and gas in the untouched and totally unproven waters in the Russian part of the Arctic. BP new chief executive Bob Dudley is hosting a press conference later where details are expected. It could mean the Russian government owning a significant part of the UK’s largest oil major. Shares of BP listed in the US climbed 3.5% to $49.18 ahead of the news conference. Such a deal would be the first significant deal the oil firm has done in the wake of the Deepwater Horizon spill crisis last year. Since that disaster in the US Gulf of Mexico BP has been disposing of assets. The New Republic today published an article by the Nobel prize-winning/former US Presidential candidate, Al Gore. Say what you like about Mr Gore, but he is a consistent and, on the whole, articulate advocate of radical change to reverse global warming trends. When he talks, people listen. [P]etroleum is visible on the surface of the sea and carries a distinctive odor now filling the nostrils of people on shore. Carbon dioxide, on the other hand, is invisible, odorless, tasteless, and has no price tag. It is all too easily put “out of sight and out of mind.” Because the impacts of global warming are distributed globally, they often masquerade as an abstraction. And because the length of time between causes and consequences is longer than we are used to dealing with, we are vulnerable to the illusion that we have the luxury of time before we begin to respond. But neither assumption is correct. Most of the heat trapped by greenhouse gases is stored in the oceans and reemerges over time into the atmosphere. As a result, we are capable-–through inaction—of making truly disastrous consequences inevitable long before the worst impacts are manifested. Our perception of the dangers of the climate crisis therefore relies on our ability to understand and trust the conclusions reached by the most elaborate and impressive scientific assessment in the history of our civilization. In other words, rather than relying on visceral responses, we have to draw upon our capacity for reasoning, communicating clearly with one another, forming a global consensus on the basis of science, and making a choice in favor of preventive action on a global scale. This [the Gulf oil spill disaster] is a consciousness-shifting event. It is one of those clarifying moments that brings a rare opportunity to take the longer view. Unless we change our present course soon, the future of human civilization will be in dire jeopardy. Just as we feel a sense of urgency in demanding that this ongoing oil spill be stopped, we should feel an even greater sense of urgency in demanding that the much larger and more dangerous ongoing emissions of global warming pollution must also be stopped to make the world safe from the climate crisis that is building all around us.